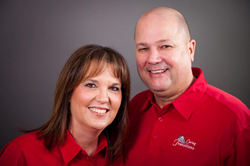 Caring Transitions is pleased to announce that Craig and Amy Edwards, the local owners of Caring Transitions of Rockwall, have earned the Caring Transitions’ Rising Star Award. This national recognition is given to a new franchisee who has demonstrated strong leadership and business growth in their first year of operation. The Rising Star Award was presented on February 19, 2019, at the Caring Transitions national conference. Craig and Amy are both from Texas – Craig grew up in Garland before moving to Rowlett almost 25 years ago. Amy grew up in the Dallas area and graduated from the University of Texas. Amy worked as an elementary school teacher and later stayed home to raise the couple’s four kids. All of them went to school and played youth sports in Rowlett. Craig has built his career in the wholesale food business. They opened their Caring Transitions franchise in March of 2018.